Reading is simply a part of me and I'm thrilled to find it becoming a part of my children as well. Even as I scold my 9-year-old for staying up too late with a good book, I'm quietly glad that reading is his activity of choice. 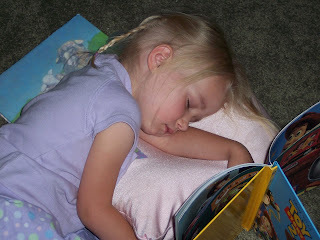 I love to hear my 6- and 4-year-olds ask for "reading time" in lieu of their daily "resting time" (and then I carefully, smilingly remove the books after they fall asleep). I cuddle with my 2-year-old as we read the same books every night, the same books I read to my other kids when they were tiny. Reading is what we do at our house. I like the suggestions from PBS on how to create a literate home, especially the advice on acqiring books; here are some ideas that work for our family. 1. My children live by the same rule as I do: read a lot of books, but buy your favorites. Of course, to find our favorites, we have visit the library frequently. We generally choose out three books apiece, and by the time they are returned we have them almost memorized (which I think is a good thing). We keep a list of books we like (for checking out again another day), and books we love (that we want to add to our own collection). 2. I like to receive books as gifts, and so do my kids. This past Christmas, my oldest loved receiving a B&N giftcard for the first time; the younger kids were surprised that Santa knew just the book they had always wanted. Grandparents have been good book-givers as well, and the kids especially like the books that are inscribed with a special message. 3. We have a fantastic used bookstore nearby that is always excellent for browsing, and a great source for classics, vintage children's books, or "temporary" paperbooks (these are good for the car, the toddler's room, and the bottom of the bookshelf--we won't cry if they're ruined.) I also check out Amazon (often used books) and Ebay (good for collecting a series) when I'm looking for specific titles. 4. We make time for reading everyday: that is what truly makes our books special. You should also check out half.com. It's a division of Ebay, and they have great deals on books!